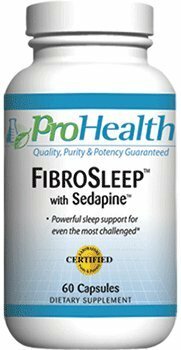 FibroSleep® is a powerful sleep aid that is a combination of pure, natural ingredients to support deep, restorative sleep. Lemon Balm - used to promote comfort, relaxation, calm digestive system and nervous system. Provides synergistic sleep support when combined with Valerian. Ginger - a calming anti-inflammatory* and digestive aid used to settle the stomach and promote peristalsis. Offers over 150 times the protein digesting power of papaya; contains at least 22 known anti-inflammatories* and 12 antioxidants. Peppermint - traditionally used as a relaxant; calms the muscles of the stomach, helps reduce excessive gas production, improves flow of bile used in fat digestion, promotes proper elimination. Hops - acts directly on the central nervous system to support relaxation of smooth muscle tissue; central nervous activity, and calms and soothes digestion. ZMA® - a great source of extremely bioavailable magnesium and zinc. Supports sleep and healing by aiding in the transport of oxygen to nerve and muscle cells. Magnesium is the number one mineral deficiency in the United States, and zinc is the most important mineral for immune system function. Magnesium Taurinate - a bioavailable yet gentle source of magnesium - along with the nervous system calming amino acid L-taurine. GABA - the main calming amino acid in the central nervous system, this naturally produced substance is able to induce relaxation and sleep*; known for supporting healthy pituitary function and a calming effect on over-stimulated neurons. Melatonin - a potent brain antioxidant* with a particular role in the protection of nuclear and mitochondrial DNA; supports the body's own production of the tranquilizing neurotransmitter serotonin, which plays a key role in healthy sleep patterns and mood. The most popular sleep support compound in the natural food industry. 5-HTP - used by the body to make serotonin. Several small clinical trials have found it may provide significant support for sleep, mood, and migraine*. L-Theanine - a calming amino acid found in green tea that can increase levels of GABA. Studies suggest it may reduce feelings of mental and physical stress and may produce feelings of relaxation* and is thought to enhance immune function and boost levels of glutathione. Increases the brain's alpha wave activity - associated with deep relaxation.